New book, some shelf wear to cover. 304 pages. 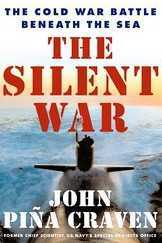 John P. Craven was a key figure in the Cold War beneath the sea. As chief scientist of the Navy's Special Projects Office, which supervised the Polaris missile system. He was later intimately involved in planning and executing America's submarine based nuclear deterrence and epionage activities, he was considered so important by the Soviets that they assigned a full-time KGB agent to spy on him. In this book, Craven gives his own insights into the deadly cat and mouse game that U.S. and Soviet forces played deep in the worlds oceans.